Senior captain Amy O’Neill on the St. Francis Women’s basketball team has recorded her first career triple-double in today’s game against Sacred Heart University. O’Niell ended the game with 13 points, 13 rebounds, 12 assists, and also 4 steals. O’Neill also made history tonight by becoming the first player in St. Francis College basketball history to record a triple-double as a Terrier. The Australian born point guard transferred to St. Francis College from Cowley Community College located in Arkansas City, Kansas. During her time there, Amy averaged a total of 12.7 points, 3.6 assists, and 3.2 rebounds per game. Since joining the Terriers roster in 2017, Amy has made quite the impression as she averaged 6.7 points, 5.1 assists, and 4.3 rebounds per game her junior season and is currently averaging 9.7 points, 7.8 assists, and 6.7 rebounds per game following tonights game. 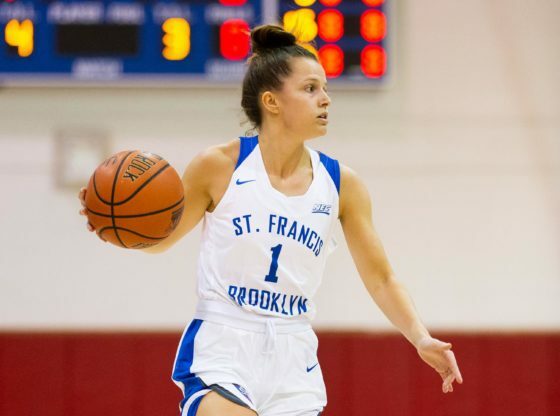 It has been quite a year so far for St. Francis College basketball as many milestones have been accomplished this season with the most recent milestone coming from Amy’s teammate, Maria Palarino, scoring 1,000 career points this past Thursday. As the Women’s basketball team is heating up in conference play, we wish them the best of luck in the remainder of the regular season.